Printing your own paper is an entire subject in and of itself. There are hundreds of possibilities! 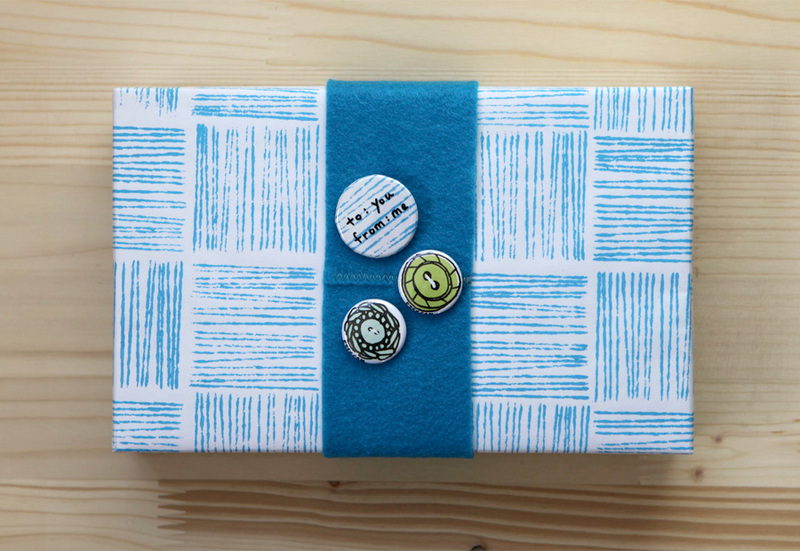 This clever idea is from Christine Schmidt’s book: Print Workshop. It’s created by wrapping string around a block of wood and stamping. To design your own wrapping paper, consider printing with stamps, attaching stickers, or printing designs from your computer. Cut strips of felt to use as a ribbon. You can stitch the strips end-to-end to lengthen, or use double-sided tape. Pin button badges to the felt ribbon to decorate. Try Vis a Vis wet erase markers to write a personal note on one of the buttons. The marker can be removed from a plastic surface with a damp cloth. I made the larger button myself with a tool from Badge-A-Minit. I acquired the two smaller buttons at an Etsy meetup. This entry was posted on Tuesday, December 13th, 2011 at 10:43 am	and is filed under diy, Gift Wrap 2011, Tutorials and Tips. You can follow any responses to this entry through the RSS 2.0 feed. You can leave a response, or trackback from your own site.